Shishkebab, Shnishkebab. | I Am Too a Food Aficionado! 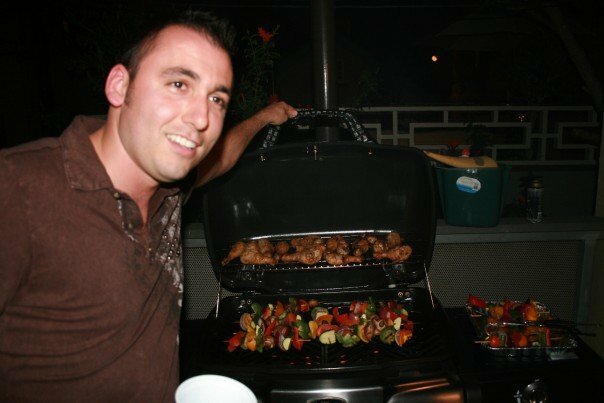 A very good friend of mine, Gary, cooked an impromptu BBQ last night – and the main course was (you guessed it!) – Shishkebab! It was a fine meal. As a rule, I’ll never turn my nose up at food, I appreciate all types, but I was infinitely more interested in the conversation about his Pizza Disaster that took place in Catalina Island this past weekend (apparently he took one bite and called it quits on the entire pie!). 1.) Juice Retention (or lack thereof!) – The deadly sin is that the Chicken and Beef is cut into pieces. Right away, you can kiss any juice-retention in the meat: Goodbye! As soon as you get those suckers off the grill, any juice left in the meat just escapes. I’m such a fanatic about juice retention that I cook chickens ‘whole’ on the grill, and ensure that a steak that comes off the grill ‘rests’ for at least 5 minutes in tinfoil so the juices can redistribute. 2.) Crappy Cuts – The actual cuts of meat found in Shishkebabs are breast (for chicken) and some type of loin (for beef) – two of the most un-tasty cuts. Again, where meat is involved, fat + juices must follow, to really please the pallet. 3.) Deceiving Presentation – Ever watch those nature shows where the fly is buzzing around this beautiful flower, and suddenly the pedals clamp down viciously crushing the fly (yes, I’ve even had time to watch Blue Planet). The point is, Shishkebabs look REALLY good on the shelf in the Grocery section. The way the peppers (the green and red colors just pop) and onions contrast the beef and chicken – it’s very pleasing to the eyes. But it’s a deceiving ploy to trick your eyes into telling your brain to tell your arm to pick up the package and put them in your shopping cart! Am I saying you can’t eat Shishkebab? Negative. I’m not trying to start a holy war. You can go to an appropriate Lebanese restaurant and get good Shishkebab (They really know what they’re doing with marinades, and nice cuts of meat, cooked just right), or if you’re properly trained in the skewering art, you may be able to pull it off yourself, but don’t think you can just grab a pack off-the-shelf and it’s going to be tummy bliss. 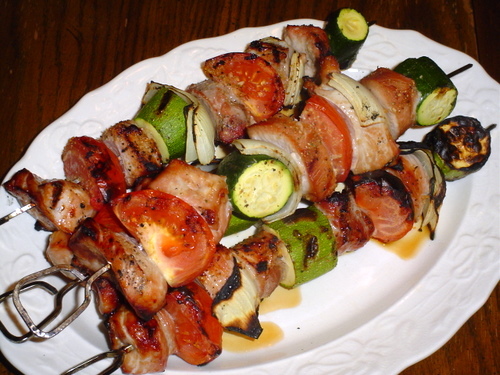 Now, if you really have a hankering for something on a stick, the other alternative is to make vegetable skewers (the vegetarian’s answer to shishkebabs). 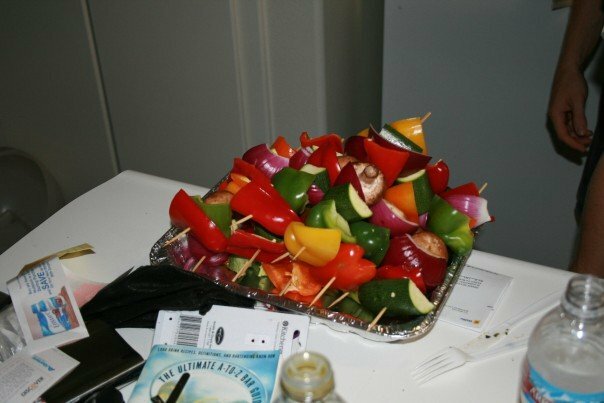 Pictured here are veggie skewers, which complimented the chicken drumsticks served recently at our Venice beach BBQ one particular Saturday evening. We had three varieties of peppers, nice red onion, mushroom and zucchini. Preparation is a cinch. Simply drizzle olive oil (use as much or as little as you’d like), add crushed pepper along with some nice salt, and a few herbs if you feel inclined. They can be prepped ahead of time, or you can do them while the party’s heating up. I try to cook veggies on the grill at high heat, so they come off al dente, with just a little bit of char. The trick is to get them on and off quickly. If you let veggies sit on the grill, or you cook them at low heat, they’re going to be reminiscent of Grandmas Green Beans (soggy). In summary, I’m not hating on Gary’s Shishkebabs (sigh), I’m hating on Shishkebabs (ouch) in general – an American interpretation gone awry. Happy grilling and good luck out there.